Guardians of the Galaxy Vol. 2 just arrived on blu-ray and I couldn't wait to see it again. My wife and I watched it in the theater when it was released and loved it, so I was really hoping it would hold up the second time around on a smaller screen. Thankfully it did! I enjoyed it every bit as much watching it in glorious HD at home on the couch. It's very rare that a sequel can live up to the greatness but somehow directory James Gunn was able to pull it off. I think one of the reasons this movie isn't just a lesser version of the first is that it doesn't just do more of the same. In the first movie a group of rag-tag misfits are forced together, bond, and end up saving the galaxy. This time around they are separated into to two groups and paired together with different characters, some new and returning characters. We get to learn more about our heroes by finding out their pasts and watch them interact with these new characters, and we get to learn more about some of the more minor antagonists of the first film, revealing their motivations and showing us that they have depth too, they aren't just bad guys. The movie doesn't try to double-down on everything and give us more action and more villains, it instead gives us the right balance of action, character development, and humor. The story in this film finds our main protagonist, Peter Quill AKA Starlord meeting his father for the first time, a father that we learned in the first film was an alien. 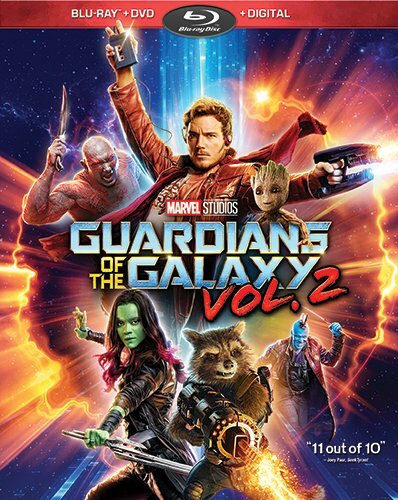 While he, Drax, and Gamora head off with Quill's dad, Rocket and Baby Groot stay behind to fix up their crash-landed spaceship and keep an eye on their prisoner, though they soon end up having to deal with some unwelcome and unexpected visitors. It doesn't feel like a re-tread of the first film at all, it feels like it's a natural progression of the story of these characters. I really love how we got to explore the characters more, especially the bad guys of the first film whom we now actually come to like as people. I also love all the throwbacks to 80s videogames since I grew up playing videogames in the 80s and recognized all the sound effects that were used and the little device Quill was using in the opening scene. This was a fun ride to go on that entertained me all the way through, it made me feel for the characters, it made me laugh, and unlike most sequels, it made me want to see a volume 3. It's an enjoyable movie that's beautiful to look at and has a ton of extras that's sure to keep you entertained even after the movie ends, so yeah, I'd recommend this one.